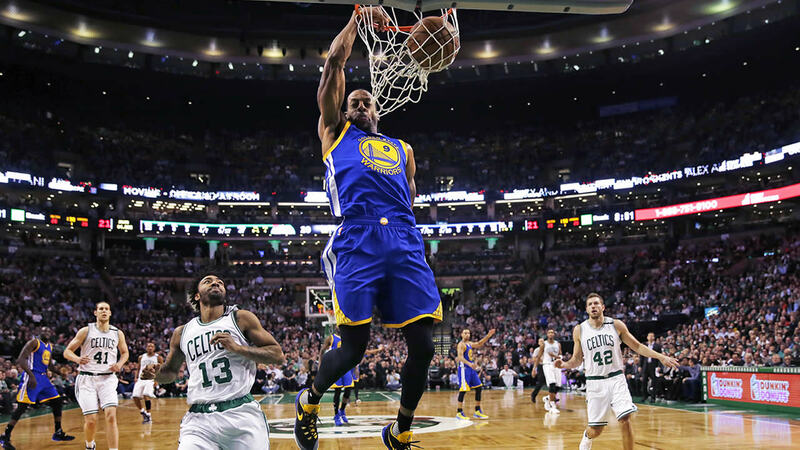 BOSTON (KGO) -- The Golden State Warriors beat the Boston Celtics 124-119 in double overtime and broke the record for the 2nd longest winning streak in NBA history with 28 games. Stephen Curry scored 38 points with 11 rebounds and eight assists and the Warriors improved to 24-0 this season by outlasting the Celtics Friday night. Counting the wins in their final four games last season, the defending NBA champions have taken 28 in a row. They broke a tie with the 2012-13 Miami Heat for the second-longest winning streak in league history, and now trail only the 33 straight by the Los Angeles Lakers in 1971-72. "Everybody contributed," Curry said. "Huge win." And the Warriors did it despite his worst-shooting night of the season. Curry made only 9 of 27 shots from the field. But he was 6 for 13 from 3-point range and a perfect 14 of 14 from the free throw line, sinking a pair of foul shots with 13.4 seconds left to give the Warriors a three-point lead - his only points of the second overtime. "Nothing was pretty about this game," he said. Jae Crowder then missed a 3-pointer to tie it, and Andre Iguodala got the rebound and drew the foul. That sent the Boston fans to the exits, but the Golden State crowd remained to see Iguodala sink both free throws and keep the winning streak alive. Kelly Olynyk scored 28 points for Boston, and Avery Bradley had 19 while guarding Curry much of the night. Isaiah Thomas had 18 points and 10 assists, and Jared Sullinger had 13 rebounds for Boston, which had won two in a row and six of its previous eight games. The game brought a playoff atmosphere and a sold-out crowd to the new Boston Garden, but this time the loyalties were more divided than usual. Although the Celtics' green still dominated, there was plenty of Golden State blue as well. "Now I can admit I'm tired," Curry said. "We'll dig deep for tomorrow." Stephen Curry has hit a three in 88-straight regular-season road games, a new NBA record for most consecutive road games with a three. Tonight's starters: GSW - Curry, Clark, Rush, Green, Bogut; BOS - Thomas, Bradley, Crowder, Johnson, Sullinger. For tonight: Leandro Barbosa (illness) is available to play. For tonight: Klay Thompson (sprained right ankle), Harrison Barnes (sprained left ankle) and Kevon Looney (right hip surgery) are out.